I got a rare opportunity last week to have the morning off with just my little man aged 20 months. Childcare broke down and my plan B and plan C were off on hols and so i had to take a day off work last week and it was great. I got to play at being at a stay at home mum for the day. The day started with me getting the chance to drop my little boy (aged 3) off to playschool, a super rare occurrence. I often feel very envious of all the ladies in their jeans dropping off their kiddies off to school as i battle my way on to the luas for another rat-race day. But today was different, i was be-jeaned and part of the school drop-off gang. Being a mum of two, i never get to have time just with the youngest fella. So i brought the ball of chubby cuteness swimming for a mother and toddler swim in a nearby swimming pool. As much i treasured this time with him , i was overcome with ferocious mammy guilt. 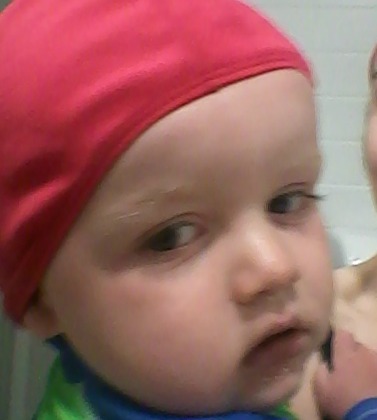 His older brother was enrolled in water babies as soon as he was 6 months and a big production was made of us bringing him every Saturday (he hated it by the way, only did the one course), but poor baba number two is 20 months old before he sees the inside of the pool. I also realised with a terrible shock that i don’t know him very well and it felt strange just for us to be on our own together which is really very sad. Sure, i know him as part of a duo with his brother but i don’t know him on his own and as an individual. Although my stay-at-home day didn’t end up as i had hoped. I am grateful that my childminder had to take the day off because now i know that i really need to work on my relationship with my beautiful little boy and get to know each other better. Mid-year resolution, give them both more one on one time! Have you ever experienced second baby syndrome where you feel they are not getting as much attention as their older sibling? That’s a good resolution to make. Do try to stick with it. I find with my boys that they are so chatty and interesting, not to mention well behaved, when they get time alone with me or my husband.